The SNP is soon to choose a new Depute leader. To date much of the discussion surrounding the election has focused on the narrow question of when to hold an independence referendum, and which times would be more likely to secure an independence victory. On the face of it for a party which campaigns for independence, and which recently won the last Holyrood election on a conditional platform of next holding a referendum were Scotland to be dragged out of the EU against its will (something which is now happening) this question seems central. In my view however, it is a dead end, and something of a proxy for a far more important discussion. To contextualise this discussion, The Edinburgh Agreement signed by both the Scottish and UK governments was secured by the Salmond administration. It consisted of the transfer of power from Westminster to hold an independence referendum. This legal transfer of power is called a Section 30 Order under the Scotland Act, which established the Scottish Parliament. Without that transfer of power formally under the law Scotland cannot hold legally binding referenda (on anything at, not least becoming an independent country). Prior to Salmond’s victory in securing this agreement, the Scottish Government had threatened to hold ‘an indicative poll’. There was debate at the time of the legality of this move. Indeed Gideon Osborne had been threatening to hold an independence referendum on the UK government’s terms (setting the question, time, voting franchise and so on). With the rapid centralisation of the police however this was no longer tenable, and in the end the UK government granted Scotland the Section 30 Order, calculating that with independence polling at around 25% at the time, that the risk of their defeat was low. Following the UK Government rejecting all compromise positions put forward by the Scottish Government in the aftermath of England and Wales’ vote to catapult Scotland out of the EU, the Sturgeon administration has also sought a Section 30 Order. This is the origin of the “Now is not the time” patronising lecture given by Theresa May. In other words the Sturgeon administration does not currently have the legal power to hold a binding independence referendum, despite winning an election on just the terms we are experiencing. This of course is very frustrating, but the somewhat successful infantile tantrum of an election campaign fought by the Tories which reduced the number of SNP MPs, saving Theresa May’s skin in her ill fated Westminster snap election, has convinced the May regime that it does not need to and should not hand over this power to Scotland. The Sturgeon administration could in theory repeat the Salmond administration’s tactic of threatening an indicative poll, however faced with a British Government on the ropes, negotiating the impossible, with only Scottish oil and gas as its remaining hard exports, once the great harrowing that is Brexit is complete, and in a context where support for independence generally hovers above the 45% secured for it in 2014, this could prove a very risky strategy indeed. Catalonia provides a salutary lesson in just how far a state Government can go (and generally get away it) in suppressing such indicative votes. Recent European history now shows us that those who would speak up in defence of smaller breakaway nations suffering political repression would be both few and far between, and largely ignored. There are sound reasons for the Sturgeon administration’s apparent caution. In this context, facing an implacable but weak UK Government engaging in chaotic tantrums, with an opposition likely to form a new government, or at least for there to be a change of leadership, alongside demographic change leading to a slow rise in support for independence over time voices around the SNP Depute election like Pete Wishart have argued that it is better to wait for more favourable times to seek an independence referendum, rather than go down the potentially very hazardous road of launching an indicative poll in the here and now. It is now too late for the Sturgeon administration to pull off a referendum before Brexit has taken place. We may take this as a sign that the SNP leadership as it is currently comprised tacitly agrees with the Wishart analysis. An infuriated section of the SNP and YES movement grassroots (which has largely been implicitly asked to do nothing between election campaigns) has decried this calculus as nothing short of a sell out. In reality tho the Sturgeon administration’s error lies elsewhere, and this debate, vocal and terse tho it is, is completely mislocated. Sturgeon and the SNP leadership are right to be cautious, but they have for the entire time of Sturgeon’s leadership disdained movementism. This has been disastrous. 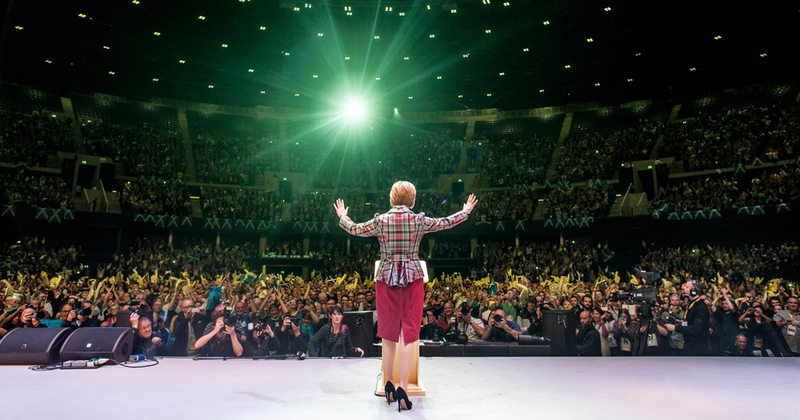 For a leadership that came into power on the back of mass rallies in Scotland’s largest venues, not once since has the party ever directly invoked turnout for a political point, other than canvassing for elections or the now largely forgotten survey. Meanwhile YES events have continued, often without purpose, direction, a demand or a target, and often alongside accompanying statements from SNP politicians decrying them in some form. This policy more than any other is self-defeating, and the subject requires a wider analysis than there is time for here. However faced with the May regime’s attacks on the devolution settlement, and its total hostility to the granting of a Section 30 Order, it should be obvious that what is urgently required is a visible demonstration of bias, aimed against those particular autocratic and anti-democratic acts by the widely reviled UK Government. To a certain extent grassroots anger (of the “use the mandate” variety) is a reflection of this dynamic. Faced with near constant attack on our rights and freedoms, the SNP leadership still shows little sign of mobilising its forces to contest or counteract this pressure. Instead it appears from the outside peering in, to look to a future that is the result of political progress, where demographics have shifted in our favour and what was once an intractable problem (the Section 30 Order) is negotiated away with future electoral mandates and a change in UK leadership. The trouble is that the myth of political progress is just that. There is no law that says as young people get older and more young people are born that demographic shift will necessarily lead to an independence majority. That is how things look at present, but it’s important not to turn this into some kind of secular rapture. Things can change. As it becomes harder to retire in Southern Spain and Southern France, Scotland may yet play host to increasing numbers of upper middle class and Thatcherite English pensioners which could yet swing independence bias the other way. People of talent held hostage to an English Nationalist lost decade of post Brexit economic decline may yet choose to emigrate. Perhaps neither of these things will happen, but you can’t lay faith in things which you don’t control, and the most obvious thing to do is to take control. Rather than obsessing about the date of a referendum, the campaign for our rights and political freedom should be on, should be visible, should be on the streets. This is the critical mistake that is being made, and has been made, and it is the core question that the SNP membership should be focused on. We should, rather than be obsessing about things we cannot control, be determined on focused on things that we can, which aid our cause, persuade others, and place real pressure for once on our opponents. What we have in abundance more than any other force in Scottish society is the capacity to mobilise massive numbers of people to turn out to things that we organise, in almost any part of the country. We must immediately rebuild and foster movementism, and demand that Scots be given a choice about whether we suffer the Brexit self-imposed racist embargo. We need to start spelling out on doorsteps how independence can rescue us from decline and Nationalism. That campaign can and must be independent of the process debate, but crucially it’s also the one thing that can win us the process and secure a Section 30 Order. At the moment the SNP leadership repudiates movementism of this nature, but this very silly, as it’s really the only control they can exercise over the situation, and if there is a question that matters most of all in choosing a Depute it is this one. Waiting for political progress to happen without an auger on that process is a bit like waiting for a secular version of the rapture and a UK government to grant us its blessing. Demanding that our Government launch an indicative poll, and then make some kind of Universal Declaration of Independence based on that is deeply foolhardy. Setting up a divide between these two polarised positions is a sterile and pointless debate, and one that avoids discussing the real questions facing our movement. It’s like watching two blind moles swinging at each other, both failing to recognise their only chance of progress lies in working together in a totally different way. A thoughtful piece, Nick, and I support much of what you write. The Movement as you put it has shifted ground. Bella still has worthy articles but the thrust of debate has moved to the pithy, direct media outlets such as Facebook. The SNP struggles at a local level to reconcile Westminster-provoked austerity and vitally-needed services for our communities. This reflects badly on the SNP Government which looks helpless at times, a bystander to the main act down south. My optimism, though, derives from the grass-roots. The National has become a serious, challenging newspaper. Next month we will have a major March for Independence in Glasgow, hoping to bring all groups together. The HOOP demonstration at Holyrood provided encouragement to many of us who are impatiently screaming for another referendum, who advocate boldness, win or lose. On most things Westminster does not act in our name and we want freedom from the outrages of association with a nasty Government voted in by an uncaring, xenophobic population. The SNP must grasp the thistle or it will wither, offering inadequate solace to its would-be supporters. Whoever is the new Depute may be a touch irrelevant but the direction of travel is crucial. The Common Weal has recently published a fine book on the road map following a successful Independence Referendum. That is optimism and I applaud its boldness. I have to disagree with you about the National. I don’t consider it serious or challenging. I accept the MSM – press and broadcasting – are truly appalling, one-sided and biased. The National in my view just delivers the same only in a pro-independence vein. It doesn’t help the debate. Chris – have you noticed there are some problems with Facebook in the news recently? Indeed, many problems, not least the recent exposures of private information. The crude manner of the debate in social media also bothers me greatly because it doesn’t help the cause or move the discussion further. My point, though, is that the debate seems to be more evident these days in social media which includes but is not solely in Facebook. It rather follows Nick’s argument that grassroots discussion will find its platform and if the SNP does not provide what Independence seekers want it will move elsewhere. Marches and demonstrations can be good, but without a substantial, if less visible, movement alongside them we run the risk of having an independence movement that is all icing and no cake. We need reading groups, we need discussion groups, we need constant community engagement, movement building, journals, think tanks, public lectures and podcasts. In all honesty no one knows the future. We all have concerns about how best to achieve independence. Only time will tell whether the SNP have made the right choices on our journey to national sovereignty. However one thing is very clear to me. You don’t wait for things to change , you try and make the change. If we simply wait for polls to change or for events to change , then we become passengers not pilots. To me the polls are irrelevant, as I reckon in 3 years time they will still be 48/52 or thereabouts. People only make true choices when they are in a polling booth not at the other end of a phone. Our leaders must lead and we must follow their lead , that’s how change happens. It’s collective but a collective always needs a leader. At the moment there is concern, confusion, anger, despair loss of faith and even some apathy. This is because we are not be led , and not being reassured or communicated with. The SNP need to start talking to us again and tell us what their plans are. I think if this doesn’t happen soon the SNP will find themselves in difficulty. I think this is a natural tension between party (action timed to maximise electoral success) and movement (independent of election dates). I have the impression that the Catalan politicians are more movement aligned, and would appear at, even lead, the mass demonstrations, but I could be wrong. It’s sometimes said that the lessons of 2014 haven’t been learned – but I think there is a quiet consensus that the economic case wasn’t strong enough to go beyond those voting on conviction or principle. The Growth Commission report was meant to address this, and may still be published – which for me would be the starting gun from the SNP for indy2. But you then see the tension with party and movement. Whatever the Growth Commission say, there will be perceived winners and losers, risks and benefits, and therefore political pain. A movement lives for such demarcation and challenge, but a political party largely looks to include and show a safe way forward. A good read. I’ve wondered about what the centralisation of the Scottish Police forces was about and I’m intriged when you say: “With the rapid centralisation of the police however this was no longer tenable,”. Can you explain this a bit more? It seems like am interesting and important part of the puzzle that I don’t understand. An interesting and well argued article. Normally I would say the Catalan analogy ignores some differences: Spain had a state-wide Civil Guard police force that could be deployed rather than the army, military intervention never looks good in these kinds of circumstances and, as I understand it, Spain has a single legal system, making police intervention easier. It shoukd also be noted that the Brexit referendum was indicative only and not legally binding, but the narrow victory for leave is treated as an unignorable mandate. However, given the personality of the Prime Minister and the English nationalist revanchism of the British establishment, I wouldn’t be surprised by anything the UK did to retain Scotland. Constitutionally and hence legally the UK union only came about through the consent of a majority of Scotland’s MP’s therefore constitutionally and legally the union may be undone in the same way and this has always been well understood. Constitutionally therefore a referendum is neither essential nor required for Scotland to bring an end to the UK union. The SNP has been given such a (Westminster) majority twice yet have failed to do anything with what is de facto independence; i.e. they have bottled it. We are not talking here about a hapless region with no sovereign or legal status (i.e. Catalonia), we are talking about one of the two sovereign kingdoms that created and still constitutes the UK union itself through international Treaty and subsequent Act of the Scottish (and English) Parliament. Scotland therefore has no constitutional need for any dubious referendum, more especially a referendum which even in the unlikely event of a Yes vote would depend ultimately on the consent of 500+ MP’s from another nation. By making it a two-stage process with a referendum, the party was able to separate independence from party appeal. In other words they made it safe for unionists or the unconvinced to vote for them. A reversal of that policy would presumably see those voters peel away. In terms of the independence aim it would seem logical to focus on the actual constitutional and hence legal position of Scotland as joint signatory to and creator of the UK union and how that process was achieved and hence how it may be undone, rather than depend on any party political process, strategy or policy. It does seem eminently logical, indeed constitutional for a majority of Scottish MPs to be entitled to bring the 1707 union to an end. Indeed I believe Mrs Thatcher said that if Scots wanted independence then all they needed to do was to elect a majority of Scottish MPs who would vote for it. Quite why we need a referendum permitted at the gift of Westminster, or a referendum is a good question. Or is it simply that the Scots MPs count for nothing, and that Jocko monkey has to jump through whatever particular hoop the Westminster circus master decides at the time. We used to talk of Labour’s Feeble Fifty. The comment is certainly not misplaced as we get dragged out of Europe, have a Westminster Government we did not vote for, whilst all the time having a majority of SNP MPs. There seems little doubt that the present Westminster parliament (and the so styled ‘UK’ government) is an international treaty-based entity, constitutionally. The latter was created by a simple majority of MP’s of two nations, both of which still very much exist today, and who voluntarily dissolved their own parliaments in order to create a joint legislature and administration. Either of the UK’s two signatory nations (neither of which are dissolved) could therefore give notice via a similar national majority of its MP’s to withdraw from the UK political union resulting in the dissolution of the (jointly created) Westminster parliament and re-establishment of national parliaments for both Scotland and England. The constitution of the UK parliament/state is effectively the treaty and act(s) of union, the latter enacted via a simple majority of MP’s representing each nation. What was done constitutionally can therefore be undone in the same manner. “Universal Declaration of Independence” – If you mean UDI (which I wouldn’t advocate btw) doesn’t that normally translate as “Unilateral Declaration of Independence” ? Arguably this (UDI) option does not readily apply to Scotland when withdrawing from a UK union or any other such union for that matter, just as the UK withdrawal from the European Union is not UDI in respect of the UK. Neither of the nations of Scotland nor England were dissolved in 1707, only their respective national assemblies were dissolved and a new joint administrative assembly created. Both Scotland and England still retain many national features and key institutions and therefore remain distinct nations in their own right. Constitutionally Scotland is not therefore a mere region or colony of the UK as some people seem to imagine (despite the fact it may often be treated as such, a prime example being the rather demeaning ‘devolved’ assembly); in reality Scotland IS the UK just as much as England and therefore Scotland constitutes the UK just as much as England does. Scotland is merely withdrawing from a political union styled as the ‘UK’ and primarily departing the latter’s common administrative arrangement that is the UK Parliament. Further, as both the Scottish and English parliaments were dissolved at the constitution and commencement of the UK union and a new single UK parliament created, it stands that the present UK parliament would similarly be dissolved when either Scotland or England withdraws from the UK union; i.e. the UK ‘state’ ceases to exist upon the exit of Scotland or England, and new parliaments for Scotland and England would need to be established. Previous assumptions on ‘successor’ or ‘continuity’ states are perhaps not as clear cut as some people might imagine. Thanks for those posts. I haven’t readily understood when you’ve discussed this before but I found these latest contributions very informative and helpful. I’d see a more viable (though not necessarily more imminent) rallying point for the movement as being around the UK refusal to accept Holyroods continuity bill. We’ve seen it come to life around Clara Ponsati, and that story is not yet over. There is great value in having an independent independence movement. Popular pressure can push a comparatively cautious Scottish executive to unconventional (or potentially unconstitutional) action. If it is, or appears to be, controlled or orchestrated by the SNP. Then the authority and authenticity of both are undermined. Anyone who follows Bella even casually would be hard pressed to describe the movement as under SNP control or even to conflate support for independence with enthusiasm for the SNP itself.